A community well in Sierra Leone, which was built by Trócaire’s local partner organisation KADDRO. (Photo: Andrea Sciorato / Trócaire). Access to safe drinking water is a fundamental human right, said Pope Francis in a message released for World Water Day. The UN observance takes place annually on 22nd March with the aim of advocating for the sustainable management of freshwater resources. In a letter to the Director General of the UN Food and Agriculture Organisation, Dr José Graziano da Silva, Pope Francis said these aims were very much in line with Church teaching, most notably his own encyclical, Laudato Si: On Care for our Common Home, which His Holiness published in May 2015. Access to water is increasingly becoming a source of political conflict. The Pope made no reference to any particular situation, but many who take an interest in human rights will have noted that earlier this month, Israeli forces cut off the water supply to some 2,600 Palestinians living in the Jordan Valley in the occupied West Bank. Such is the demand for wter in the Middle East today that the amount of water flowing from the River Jordan into the Dead Sea is 10 per cent less than what it used to be – 90 per cent of the water is diverted, to be used mainly for agricultural irrigation. In the face of climate change, the Pope said that in addition to developing long-range water projects, it is necessary to develop financing plans for these projects. However, there is a danger that drinking water will become “a mere commodity, exclusively regulated by the laws of the market”. One way you can help give people in the developing world access to water is by supporting Trócaire’s Lenten Appeal. 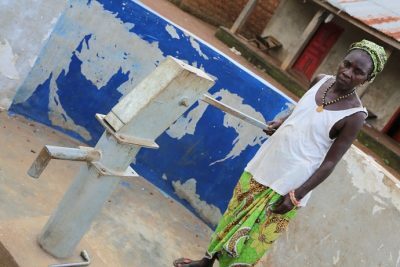 The charity has funded many community wells in Africa, giving thousands of people easy access to life-giving drinking water.